In America "the streets were paved with gold." That was the mistaken notion of many an immigrant to the United States in the late 1800s and early 1900s. On Long Island, deluded sojourners from Italy were to find that in fact there were few streets and that they themselves were to be the ones to build them. Covering more than a century of history, Long Island Italians depicts the transition of urban Italians as they moved increasingly from the city to the suburbs in Nassau and Suffolk Counties. They were attracted to Long Island by economic opportunity, the availability of arable land, home ownership possibilities, and alternatives to harsh city life. There, they became the largest of all ethnic groups, with more Americans of Italian descent living in one concentrated area than anywhere besides Italy. The Italian American presence is a continuing phenomenon, today comprising about 25 percent of the total population of Long Island. 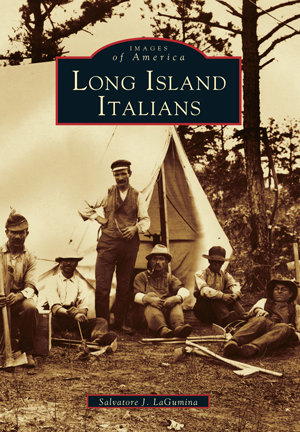 Long Island Italians graphically illustrates that Italian labor was vital to the development of Long Island roads, agriculture, railroads, and industry. By the early twentieth century, Italians made up the bulk of the work force. The book goes beyond the laborers to show also the warmth of Italian family life, the strength of the social organizations, and the rise of the politicians. Salvatore J. LaGumina, director of the Center for Italian American Studies at Nassau Community College, is a recognized authority on Italian American history and the author of numerous books and articles on the subject. Combining his wealth of knowledge with more than 200 exceptional photographs, he has produced an informative and enlightening portrait of the Italian people—at home, at work, and in society—who did so much toward developing the communities of Long Island.